Trump And His Organization Lawyer Up For The Ethics War Ahead : The Two-Way Eric Trump called it an "exciting new chapter at the Trump Organization." But to progressive group Public Citizen, "It wouldn't matter if the Trump Organization hired Archbishop Desmond Tutu." White House press secretary Sean Spicer said Wednesday the president is adding lawyers to his staff to handle ethics complaints. Nobody in Washington ever went wrong by hiring more lawyers, and now President Trump and the Trump Organization are beefing up their legal teams against an expected surge of conflict-of-interest allegations. 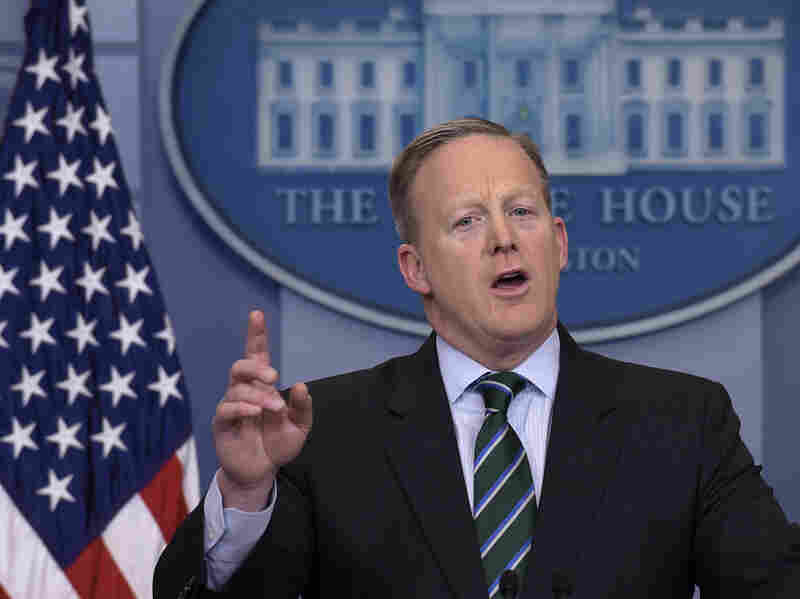 White House press secretary Sean Spicer said Wednesday that four lawyers are joining the office of White House General Counsel Don McGahn, specifically to handle ethics issues. In New York, the Trump Organization has acquired its own Washington counsel to oversee the firewall created to separate Trump from the company he will continue to own. Trump announced the firewall arrangement two weeks ago. He takes office owning a worldwide empire of hundreds of business entities, including hotels, office and residential buildings, and golf courses bearing his name. He has refused to sell them or put them in a blind trust, as past presidents have done. Spicer said, "The appointment of a team of this caliber at such a high level reflects the critical importance of ethics compliance to President Trump and his administration." Eric Trump, who is taking charge of the Trump Organization, said of its new adviser, "We look forward to following his guidance as we enter this very exciting new chapter at the Trump Organization." Not surprisingly, critics of Trump's new business arrangement weren't impressed. "It wouldn't matter if the Trump Organization hired Archbishop Desmond Tutu or U.S. Sen. Bernie Sanders to be its ethics adviser," said Robert Weissman, president of the progressive group Public Citizen. The new hires include two big names in the tiny, specialized field of political ethics law. One of those big names is Bobby Burchfield, who will be advising the Trump Organization. Burchfield was counsel to President George H.W. Bush's 1992 re-election campaign, challenged campaign finance laws on behalf of Senate Majority Leader Mitch McConnell and the Republican National Committee, and is chairman of the secret-money group Crossroads GPS. He will work with George Sorial, a Trump Organization counsel, and Fred Fielding, who designed the firewall. Fielding is a veteran of Republican White House legal teams going back to Richard Nixon. The other big name is incoming White House Deputy General Counsel Stefan Passantino. In last year's presidential primaries, Passantino advised superPACs for two of Trump's rivals. He is longtime counsel for former House Speaker Newt Gingrich and organizations in Gingrich's political network. Joining Passantino in the White House are Uttam Dhillon, chief oversight counsel for the House Financial Services Committee; investigative counsel Scott Gast of the Office of Congressional Ethics; and Pennsylvania lawyer James Schultz, who advised the Trump campaign during the Republican convention last year.